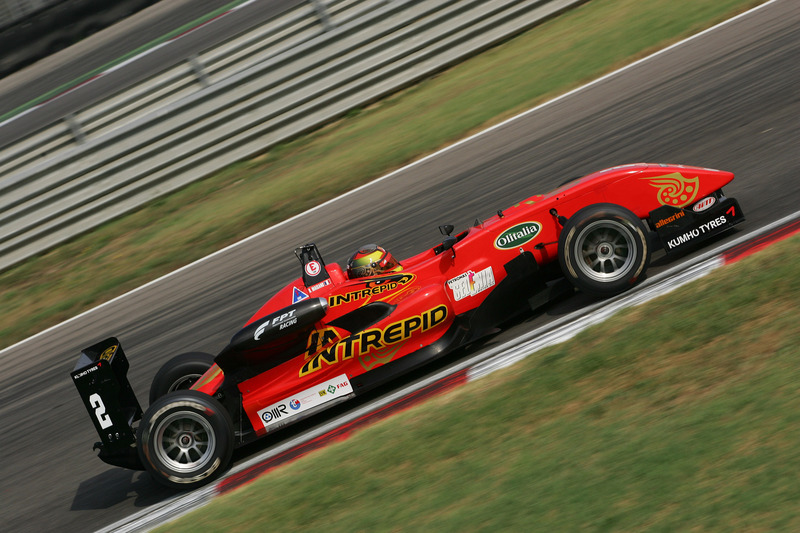 03/09/2011 - After showing his competitiveness in free practice, Brendon Maisano set the first pole position of his season in Adria. The French driving for BVM-Target, reigning champion of the Formula AciCsai Abarth, dominated qualifying of the fifth round of the Italian Formula 3 Championship in Adria. Thanks to a laptime of 1´11.763, at an average speed of 135,546 km/h, Maisano, whose best qualifying was the sixth place in Imola, set the pace and inflicted a 148 thousands gap to his fellow pupil in the Ferrari Driver Academy Raffaele Marciello (Prema Powerteam) and two tenth to the Roman Eddie Cheever (Lucidi Motors). Behind this rookies trio was the current classification leader Sergio Campana (BVM-Target), who was faster of the two Team Ghinzani's cars driven by Edoardo Liberati and Facu Regalia by 216 thousands of a second. Fourth row of the grid for the French Maxime Jousse (BVM-Target) and the Brazilian Victor Guerin (Lucidi Motors), while the Milanese Kevin Giovesi (Lucidi Motors) and the Californian Michael Lewis (Prema Powerteam) will be in fifth row less than four tenths from the pole position and ahead of Andrea Roda (Prema Powerteam), Simone Iaquinta (JD Motorsport), that will actually start last due to replacing the second engine unit and Federico Vecchi (Linerace-CO2 Motorsport). Maisano's fastest lap arrived in the second part of the qualifying. The first fifteen minutes were dominated by Marciello with a laptime of 1´11.945 that made him enjoy two tenths of advantage to Cheever and Lewis, that seemed to be at ease after the setup problems of the second free practice session. Behind them, Regalia followed at two hundreds of a second, Maisano, Giovesi, Jousse and Campana separated by two thousands of a second, Liberati, Guerin, Iaquinta, Roda and Vecchi. Once a set of new tyres was on for the second part of the session, Marciello improved his fastest time to 1´11.939 ahead of Cheever (1´11.965) and Regalia (1´12.024), with the latter pushed down into fourth by Campana's 1´11.979. Maisano finally put himself on top with the laptime of 1´11.763 that was later on improved up to the 1´11.911. The last driver to improve was Liberati that recovered several positions up to the fifth fastest time. The appointment is now for tomorrow with race one starting at 10.10 (local time, GMT+2).